I have previously given my thoughts on the quality differences between a digital and an analogue video connection, but here’s an example of just one difference between them. The occasion was the combination of the new Pioneer DV-S969AVi universal disc player, and the new Yamaha DPX-1100 DLP projector in my office this evening. I guess I’m privileged to have the latter, since it’s the only one in Australia. (It has to go back to Yamaha tomorrow for training and its forthcoming roadshow). What makes these two a good match is that the former has a HDMI output, while the latter has a HDMI input. The video signal carried by HDMI is identical to that carried by DVI, that is, uncompressed digital video from standard to high definition resolutions. In the consumer home entertainment equipment arena, HDMI, like DVI, is equipped with the HDCP anti-copying encryption system. HDMI also carries uncompressed digital audio, although when plugged into a projector this isn’t relevant. The photos on this page show one difference between the digital and component video connections between the DVD player and the projector: horizontal resolution. The picture shown is a very small section of a test pattern I created and cooked onto a DVD+RW for this purpose. Across the width of the picture there are 360 of those vertical bars. The horizontal resolution of a DVD picture is 720 pixels, so I created the image in Photoshop with one pixel-width of white, one of black, one of white and so on across the whole picture. As you can see from the component video version (bottom), these bars do actually appear (despite the notional horizontal resolution limit of 500-550 pixels from this output), although the variations in brightness range from dark grey to light grey. The HDMI connection, by contrast (sorry), shows very good clarity. (I used progressive scan on the component video output because, contrary to my expectations, it provided a modest improvement in contrast compared to interlaced video). 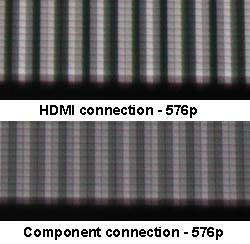 The uneven thickness of the bars is due to the mapping of them from the 720 horizontal pixel resolution of the DVD player output to the 1,280 pixel physical resolution of the HD2+ Digital Micro-mirror Device in the projector (vertical resolution is 720 pixels, for a true 16:9 aspect ratio). The Pioneer DVD player allows you to send HDMI at native resolution in either interlaced or progressive format, at 720p resolution, or at 1080i. These last two also provided better-than-component-video results, but not quite as good as at 576p. That is, I suspect, due to the superior Faroudja DCDi scaling circuitry employed in the Yamaha projector, compared with Pioneer’s in-house scaler. Moral of the story: if you’re looking at spending plenty of money for a projector (the Yamaha is likely a bit over $AUS20,000 here, and is around $US12.5K in America), make sure you get one with a DVI or HDMI input. You will come to appreciate it. Incidentally, Monster Cable now has out a range of DVI to HDMI cables and converters. They’ll be hitting the shores in Australia in early May, I’m told by Convoy International, the local distributor. This entry was posted in Cables, Equipment, HDMI. Bookmark the permalink.